The new Cape Coast stadium will host the Black Starlets in the first leg of the second round qualifier for the African U-17 Championship against Burkina Faso on Sunday, August 7 at 15:00pm. 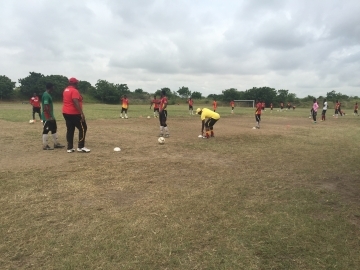 The team has been preparing since February with a 30-man roster in Prampram at the Ghanaman Soccer Centre of Excellence, but recently moved camp to Cape Coast in order to acclimate and be familiar with the pitch. Coach Paa Kwesi Fabin and his team are optimistic that they will be able to rejuvenate Ghana’s history of success at the U17 level, and make it to next year’s African U-17 Championship in Madagascar as well as the 2017 FIFA U-17 World Cup in India next year. Ghana first advanced to this stage after their opponent, Liberia, withdrew from the first round of the qualifiers, wwith Burkina Faso also drawing bye the first round; leaving both teams anxious to play with ample time to prepare. The winner of the match will face the winner of Benin/ Ivory Coast.